Well, school is in session, and since we seem incapable of experiencing any down time between holidays, all the mini fridges and Trapper Keepers are being pulled and replaced with shrieking skeleton heads and bags and bags of candy. Friends, it is officially the start of Halloween season! Personally, I couldn’t be more pleased. I love all the masks, monsters, and makeup. Pumpkins, papier–mâché skeletons, and party favors. It’s also time to bring in a new collection of spooky stories to share! My son is now old enough to move past the cutesy Halloween picture books and tackle some heavier material. 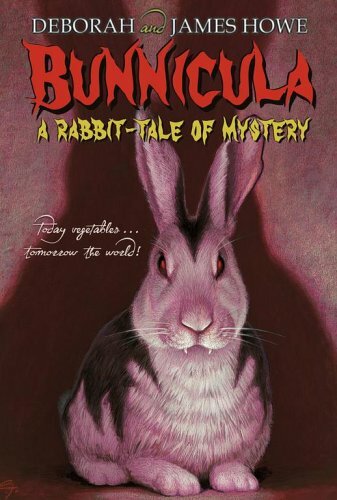 A couple of those old picture books will forever have a place in my heart, but I’m super excited to share with him the classic vampire story, Bunnicula. Narrated by the family dog, Harold, this story introduces us to the most unusual family of pets I know of. While Harold is very much a family dog, interested in snacks and naps, his companion, a cat named Chester, is a little different. He’s well-read and a little paranoid. When the family comes home one rainy night with a bunny they discovered in the movie theater, Chester is immediately wary. And as he begins to put the pieces together, wariness turns to suspicion, to fear. For it becomes clear that this is no ordinary rabbit. For one thing, he only wakes up at night. For another, he can slip in and out of his locked cage in mysterious way. And when Chester discovers that vegetables are suddenly turning bone-white, his fears are confirmed. This bunny is a VAMPIRE! 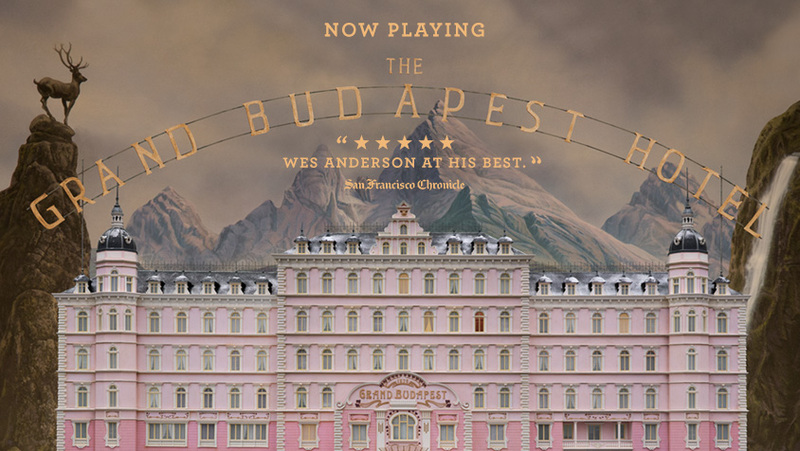 People fall into two camps: those who love Wes Anderson and those who do not. And those who do not tend to voraciously not like him. Okay, maybe I’m oversimplifying it a bit. I don’t love Wes Anderson. But I like some of his movies. Well, I had been told that this movie would be the great crossover hit that would win Wes naysayers over to team Wes. I guess the argument was that this was the least Wes Anderson film that Wes Anderson has made. I don’t know about that. The Fantastic Mr. Fox was pretty unhip. Actually, I thought this had a lot of the same quirkiness that rubs people the wrong way (or what I assume does) what with the particular way everything is arranged and shot and the characters who seem weird for no particular reason. But on the other hand, the plot seemed like a normal plot! And for me, that was a very good thing. In Grand Budapest Hotel, Ray Fiennes plays M. Gustave, the concierge of the hotel, a perfect gentleman and incredibly suave. He plays the role wonderfully as does Tony Revolori, who plays the young lobby boy Zero who is taken under Gustave’s wing. As with all Wes Anderson movies, the cast is peppered with many beloved actors, some appearing only for a moment. But I always grin when Bill Murray appears, even if briefly. I’d say this movie is worth watching if you aren’t a staunch anti-Anderson fanatic. It’s got a great story, likable characters, and everything is okay in the end. The Glamour of Hollywood has influenced interiors for decades, and continues to do so today with bold colors, plush textiles, and dramatic black and white photography. Alluring and seductive, these four bedrooms will make you feel Academy Award worthy, and ready to settle in with a dry martini and one of your favorite films in bed. The teal, cream, and gold color scheme is not only appealing, but soothing and comfortable. 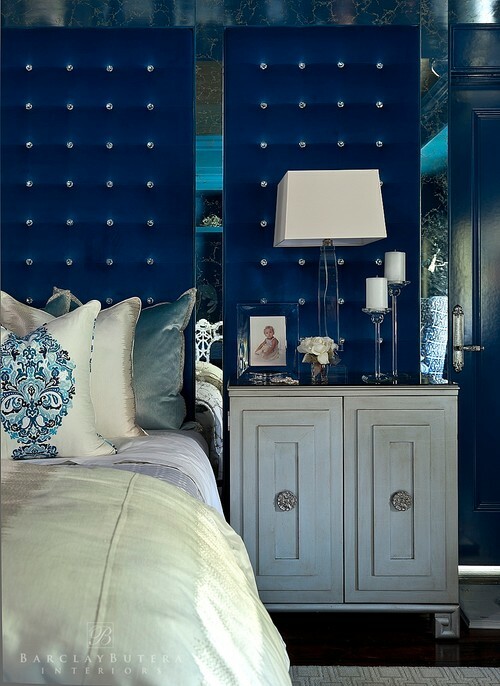 The high tufted headboard with the furry throw pillows bring luxury, the mirrored nightstands add a touch of vintage, while the geometric wall covering sets the room’s mood. The decorative throw is magnificent and feminine, and the fuzzy rug softens. White probably doesn’t seem an obvious color choice for a Hollywood-style bedroom, but here we see that’s not the case! A shag rug, faux fur bed covering, and pendant lamps exude decadence. The classic Mies van der Rohe Barcelona chair defines the corner, and a simple black and white picture hangs almost too high, yet balances the lowness of the rest of the space. The silver and red color scheme is all it takes to feel rich and glamorous in this Four Seasons residence. Components like the tufted platform king bed, the over-sized crimson sofa, the silver wall-to-wall carpeting, and the simple, modern lighting create a feeling of grandeur. In my opinion, the abstract art is the focal point in the room. 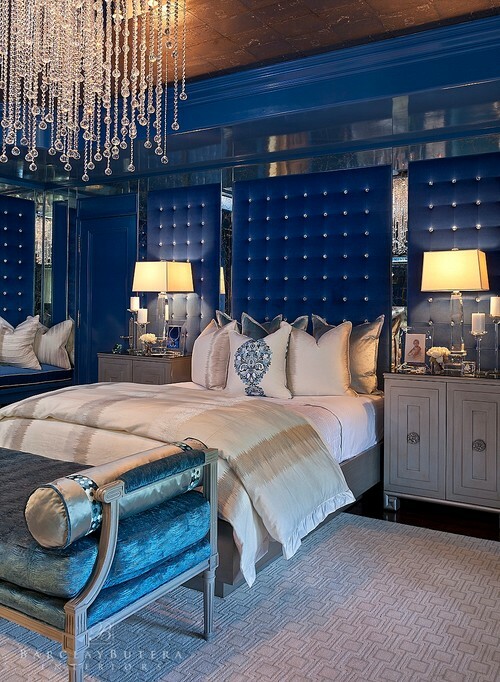 This bedroom is an example of true glam, Hollywood style. Silk upholstery, lucite and glass are simply bewitching in this space by Barclay Butera. The room boasts just the right amount of pattern, while the ivory color scheme contrasts, and the lighting creates ambiance. This five-star room looks like a celebrity’s sanctuary. I have been remiss. 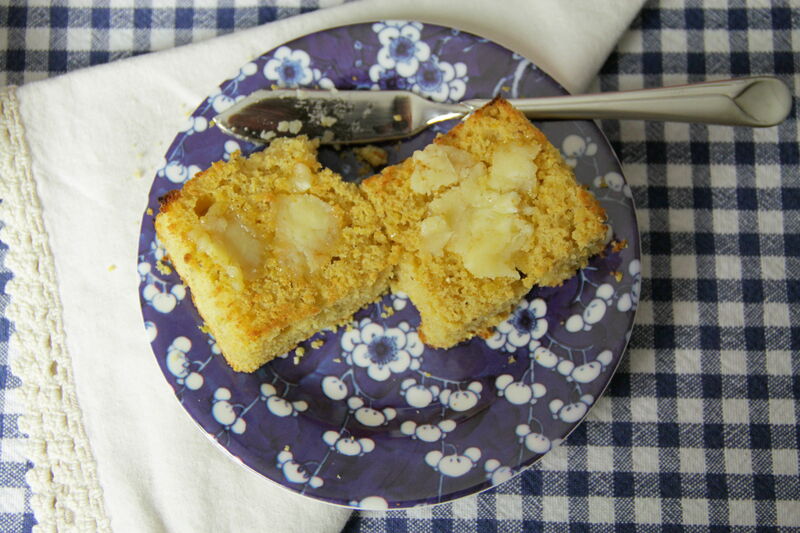 I’ve shared with you my recipes for Toasted Maple Corn Muffins and for Corn Bread Hot Browns. Even Fried Cornmeal Mush! But somehow in all this corn madness, I’ve neglected to provide my favorite recipe for simple Corn Bread. This sturdy but crumbly quick bread can be whipped up inside 30 minutes. It’s nearly as easy as a boxed mix, and much more delicious. I like to break up the sugar content with a little honey, with its old-fashioned sweetness, texture and depth. Then, I like to reprise that flavor with some homemade, spreadable Honey Butter. 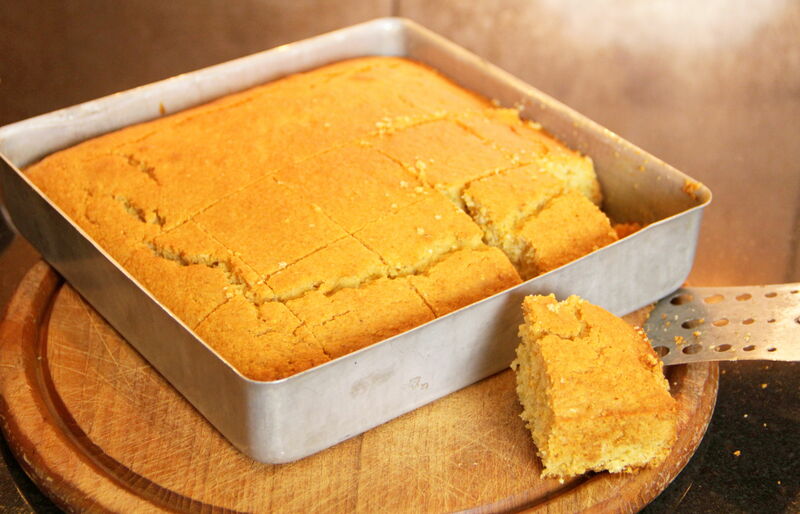 There’s nothing like a gooey glob of it melting into some oven-hot corn bread. For best results, use a pure, stone-ground corn meal. I sometimes buy it from a local living history farm, where they grind organic corn into meal in a 300-year old working gristmill. The rich, coarse meal, ground fresh, makes the perfect base for a batch of bread. My husband always enjoys a basket of fresh corn bread beside a bowl of spicy chili, and I often make some to go with dinner, when I’ve forgotten to buy bread or rolls. But best of all, I like to cut a thick yellow square of bread in half, toast it to a crumbly gold, slather it with honey-sweet butter, and enjoy a crazy, corny breakfast in bed. Preheat oven to 350°. 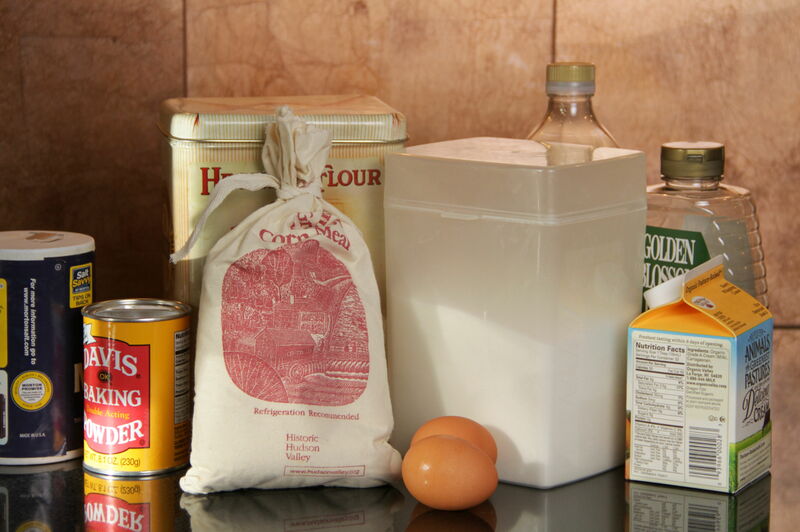 In large bowl, mix together corn meal, flour, sugar, baking powder and salt. In separate bowl, mix together milk and eggs. Stir milk mixture into dry ingredients. Add corn oil and honey, mixing in well. 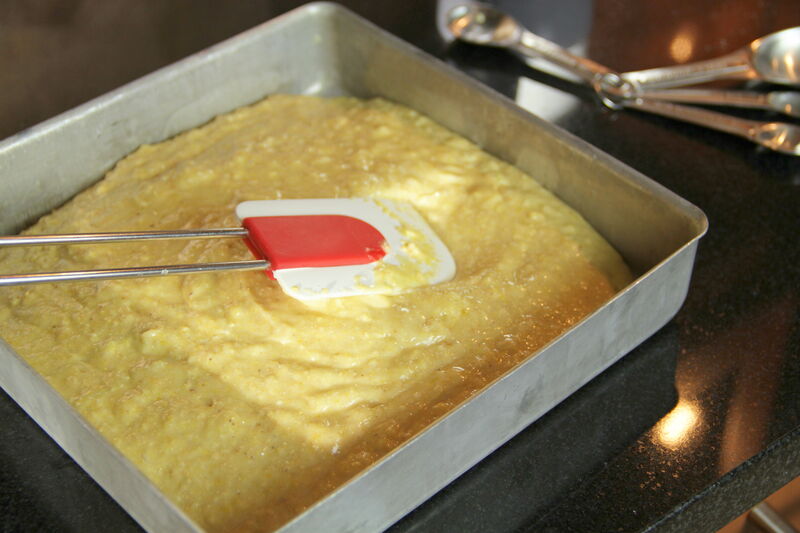 Spoon into greased 8×8-inch pan. Bake for 25 to 30 minutes until golden brown, or until toothpick in center comes out clean. You can also use 2 cast iron mini-corn molds, and bake for 20 to 25 minutes. To make Honey Butter, add softened butter to small bowl. Stir in honey and mix well. Refrigerate until ready to serve. When it comes to hanging art above the bed, the possibilities are endless. Introduce pattern by hanging multiple, coordinating prints; create height by utilizing a single large, vertical piece; or, add vibrant color to an otherwise neutral scheme. Given that a bed is usually the focal point in most sleeping quarters, artwork is a vital element in the overall design of the bed wall and the bedroom itself. Often, we tend to play it safe and hang a single frame, or merely two side by side, but there are a plethora of other arrangements to explore when hanging art above the bed. I love each of the options below. Whether you’re moving into a new room or redecorating your existing space, use these as potential inspiration for your bed wall. 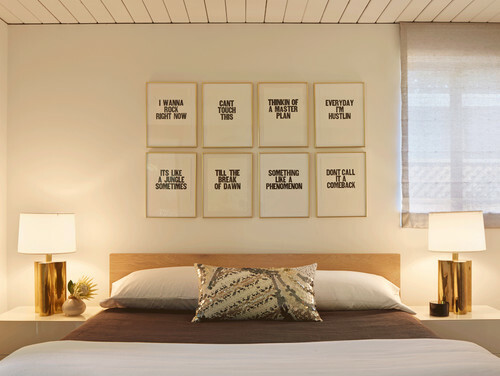 These whimsical statements look fantastic above a bed. The tightly stacked frames create pattern and give you something to ponder each night before turning in, or make you chuckle upon waking. Are you really hustlin’ every day? The pieces above the bed in this modern mountain house line up with the other windows and continue the rhythm around the room. They successfully bring the outside in, and are almost like make-believe windows. 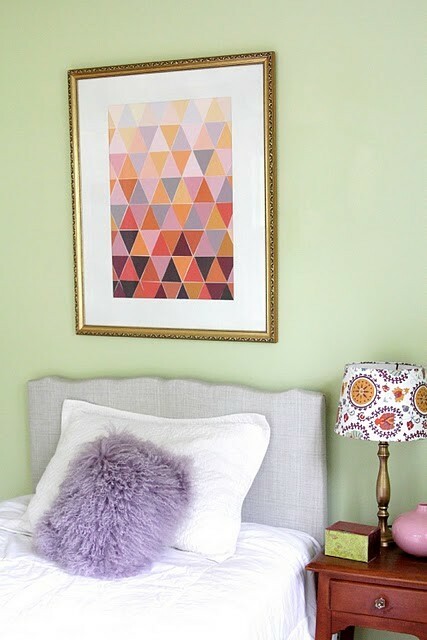 The color scheme in this room is so lovely and soothing, it makes me want to nap right now. The geometric creates pattern but also does a great job of pulling the lavender colors together within the scheme, while the pale green wall acts as a contrasting background. Eclectic Bedroom by Springfield Interior Designers & Decorators Heather Freeman Design Co. This bedroom proves that a traditional headboard is not always necessary. The tall artwork not only adds height to the low platform bed, but also gives the illusion of a grand headboard. The monochromatic gray color scheme is sophisticated, and the picture lights enhance the drama. This designer took a risk, and the space works beautifully. What’s your preferred way to hang art above the bed?